Do you know what all was done to it perviously? I'd be up for wheeling and what not and a get togethor. Besides my 78 i have a 92 that is more of a street queen. Also I have two quads if anyone would want to ride them sometime. What about meeting up at the Indy Jamboree???? I wondered if you were interested or not I remembered you being up there. I will go to badlands here in a couple weeks or so. We could do the Jamboree I went there last year I would still like to do a Hog roast out at the lake. I'm trying to get a smoker made now. Should be like the second week in Sept. my first was last year if you pre register you get a pass for the entire weekend and can stay at the fairgrounds. I'm game I live real close like 8 min. so if they're are any problems we can we can work them out at my place. I'd register early and we could camp out there as a group that would make a great M&G place. Maybe we could have a FSB banner for the show and get more potetial members interested. jambori sounds good we will deff have to get together then. as for what all has been done to my bronk by the po i dont know i got it from a guy that said all he did was keep it at his lake house and pull his boat twice a year. he told me the guy he got it from did a lift and a chip. thats about all i know about what has been done that i haven't done to it. First I like to say that I really like the idea of this thread since it seems the M&G are hit and miss. I myself havent been able to make any of them. Not to sure if anyone on the forum is from the Lafayette/West Lafayette (Purdue) are but that is where I am located at the moment. I just got my bronco back from the dead. I stripped the dizzy on the distributor shaft and replaced that. While trying to get the distributor back in I though that I may have broken the oil pump shaft. So after the fun of dropping the oil pump I found out that the pump and shaft where fine. But everything is back in working condition now. I just need to save some money and get some tires. Then I should be ready to head to the Badlands. Though it would have to be Sunday runs since I work on a farm Mon-Sat. Hopefully I will be able to get on the forum some more and get to know everyone a little better. And If I can make it I think the lake idea sounds great! Good to hear from another Indiana chapter BKO I would like to make a club type atmospere out of it. We can work out details here in this since it is non event pointed just a sounding board for us that have hit and miss computer schedules. I just got back from JBG this evening talk about a helluva trip I backed the bronco out of the gate and noticed a antifreeze leak from the heater core I just put in luckily it just needed a little more love on one hose never had another problem with it in 600mi. of driving. It was a nice long distance shakedown run 11MPG is not as good as I had hoped but it did manage to stay together all the way up and back and my speedo is right on I lost 1/2 of a 1/10th of a mi in 50mi. on the odometer counting off the mile markers. 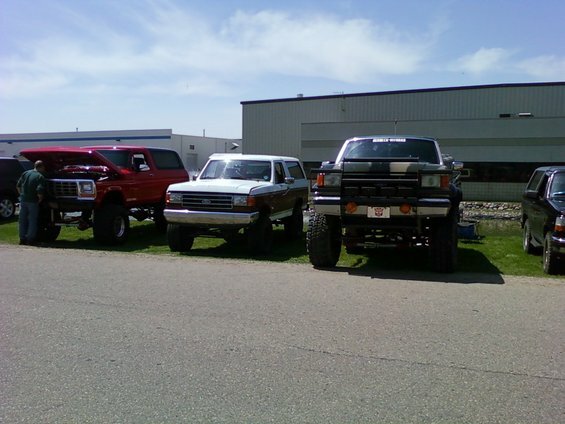 My Bronco looks like a complete pile next to these. But man is it fun to drive at the badlands and beat the crap out of and go thru things that it shouldnt at this point. If any of you guys want I will probably be going to the Badlands 5/14/11. Our last few attempts have been foiled by the weather so we want to try it this weekend. I would have loved to come out, but with work I only have Sundays free right now. I didn't make it I felt like I had been ran over by a truck saturday so I just sat on the couch and vegged out with the remote in my hand.